This file contains tips and suggestions that might prove useful. Note: The solutions described here might not work on your system. Nucleus creates archives dynamically on users requests. The URL is then of the form index.php?archive=2001-09&blogid=1. Unfortunately, Google and other search engines don't like to index pages with a question mark in it, or with too much arguments. This is because their spiders might get trapped going too deep. Nucleus v2.0 has a new option in the global settings 'URL mode'. Setting it to 'Fancy URL' mode, and performing the steps below, will make your URLs look like http://example.org/item/1234 instead of http://example.org/index.php?itemid=1234. Search engines like these URLs better. Edit the fancyurls.config.php file so that $CONF['Self'] points to your main directory. When it doesn't work (e.g. you receive an Internal Server Error): bad luck… Remove the files again (don't forget the hidden file .htaccess) and reset the Fancy URLs setting in the admin area. Now upload this file to the directory that contains index.php and config.php. Open your browser and try to open archive-1-2001-09.html. If it works, continue to read. If you get a 500 error (internal server error), it does not work on your server, so delete the .htaccess file. 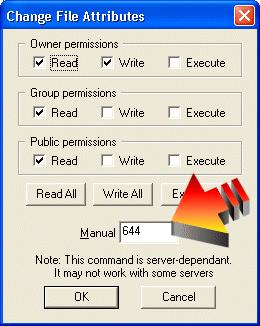 To enable some features of Nucleus, changing file permissions is required. A small guide on how to do this using an FTP client is given below. First of all, you'll need an FTP client that supports file permission changing. In this example, we'll use CuteFTP. You can download a free trial version if you don't have it. To change the permissions of a file or directory, create an FTP connection to your website and search for that file or directory in the hierarchy. Select the file by clicking on it. 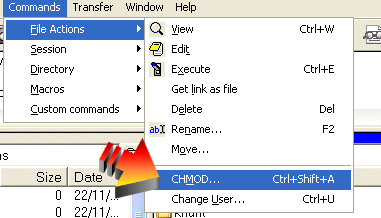 Open the menu Commands > File Actions > CHMOD… for a file, or Commands > Directory > CHMOD… for a directory. On the bottom, you can enter the code that's given in the documentation (e.g. 755 or 444). Click the OK button and the changes will be applied. You're finished now. Nucleus has a backup/restore option that super-admins can use to create a backup of the database. It's strongly encouraged to take a backup regularly (weekly or so). The backup-files that are returned are files containing standard SQL-queries, that reconstruct the state of the database as it was when the backup was created. If you have a web-based interface through which you can manage your database (e.g. PHPMyAdmin), there's most likely an option where you can import a file into the database. Use this function to restore your database. As a superadmin, you can create new weblogs from the 'Nucleus Management' screen. They will then show up on the admin area. There are several ways in which you can make your new weblog accessible. Make sure that these methods are called after the include('./config.php') statement, and before the selector(); statement! If you see tags like <br /> in the source code of your webpage, it's because the output of Nucleus (except the things defined by templates and skins, of course) is compliant to the XHTML 1.0 standard from the W3C, which is the successor of HTML 4. This way, Nucleus is ready for the future of the web. As far as I know, this XHTML support does not cause any trouble with older browsers and is correctly interpreted. What this means, is that you can perfectly create an XHTML-compliant site by using correct skins and templates. The default Nucleus skin is XHTML-compliant, but uses the “HTML 4 Loose” doctype. This way, users not knowing XHTML can not create documents with a false XHTML doctype.